taking in the shade of sun-faded wooden pavilions. This is what BLORA is all about . . . "
In late November, we haven't seen any speedboats racing by on Belton Lake, but several fishing boats dot the lake each day. 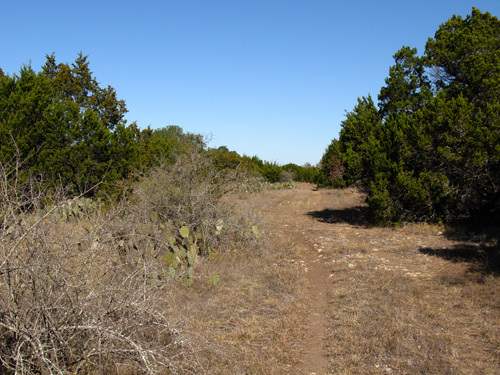 No one is wearing bathing suits or swimming at the beach, but Jim and I have been soaking up the Texas rays as we run and bike the extensive network of trails and roads through the recreation area. 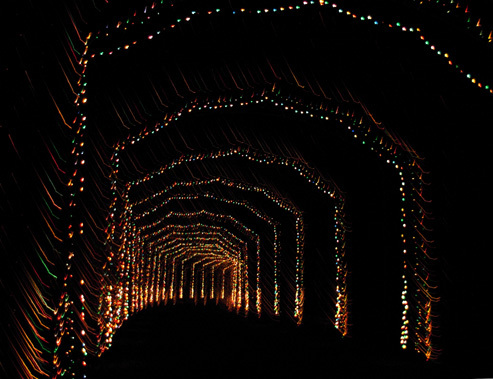 And there aren't very many folks enjoying picnics outside this time of year (despite temps in the 60s and 70s and sunshine most days), but the place is absolutely packed every night with visitors coming from far and wide to drive through the five-mile-long Nature in Lights holiday extravaganza. We picked a good time to visit BLORA, without even realizing it! 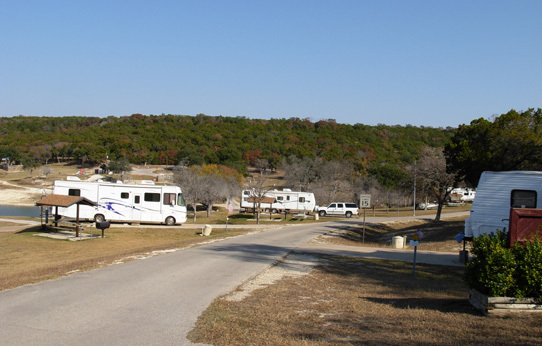 We chose what we figured was peace and quiet, spacious campsites, and nice scenery over a closer proximity to the main "populated" area of Fort Hood when we decided to check out BLORA before the other camping area at this humongous Army post. We made an excellent choice hanging out here for the past eleven days, even though it's over ten miles to reach civilization (i.e, the main parts of the post, and the towns of Killeen and Temple). The West Fort Hood Travel Camp simply doesn't compare with BLORA, at least by our standards. It looks like a parking lot; our campground looks like a park. 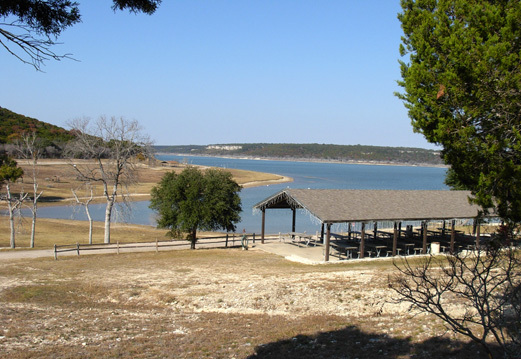 Belton Lake is a Corps of Engineers lake that was filled with water from the Leon River from 1949 to 1954. It is located west of Temple in central Texas. The lake and dam are used for flood damage reduction, water conservation, fish and wildlife habitat, and general recreation. 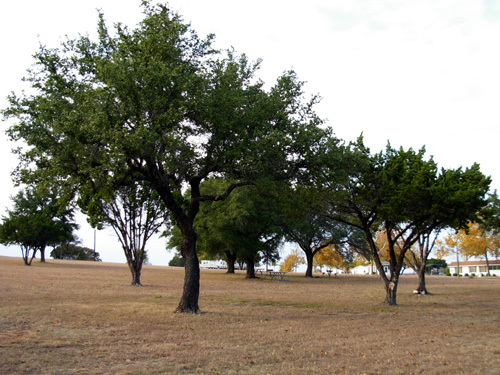 The southern and western sides of the lake are within the boundaries of Fort Hood but are not under the same tight security standards and restrictions as the main post. BLORA covers about 800 acres on the south side of the lake. Click here for a .pdf map of BLORA and the surrounding area. It will take a few seconds to load. Civilians may pay to use the rec area for swimming, the water slide, boating, fishing, picnicking, mountain biking, horseback riding, viewing the light display during the holiday season, and other activities. 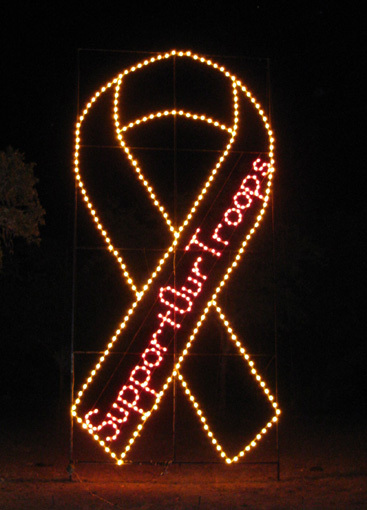 Only active and retired military ID holders and their families may use the RV campgrounds and cottages, however. They don't have to pay any extra for some of the activities like using the mountain bike course, paddle boating, or viewing the light display but some other things like horseback riding have a fee for everyone. 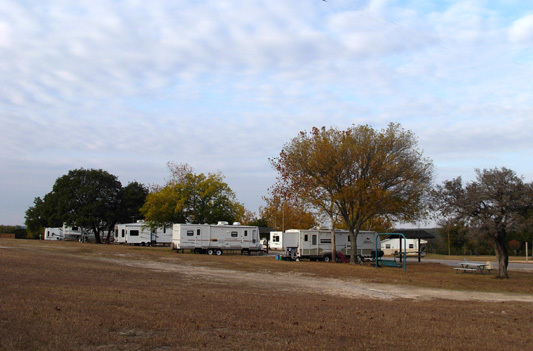 As mentioned in the last entry, there are three separate RV campgrounds within BLORA. We drove through all of them before choosing our site at Cottage RV Park, shown in the next photo:. 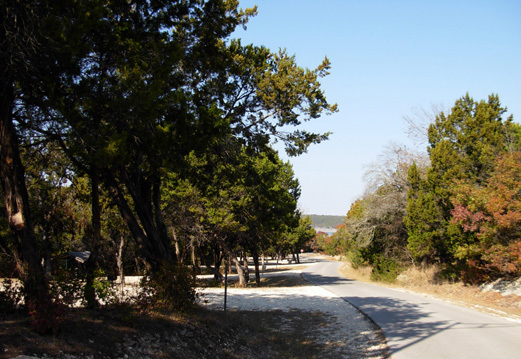 Our campground loop is located about a quarter mile from the entrance and office on the "high side" of the park. We overlook the lake, which is about 200 feet below us. We're near the ~ 900-foot peak of Sparta Mountain, which amuses us. I mean, 900' isn't what we'd call a mountain! Our house in Virginia is located 90 feet higher than that -- in the Roanoke Valley. There's what we affectionately call the "HitchHiker Hilton." We can see the lake from our camper but it's a half-mile walk, run, or ride over a cliff to reach it. (Don't worry; there's a nice road over that cliff. It's easy to drive but it's work to run or cycle back up it.) We got the next-to-last site available in this campground the morning we arrived; it has only eleven RV sites and about that many cottages that can be rented. Half or more of the spots were still available in the other two units, Deer and Cedar, which have 20-28 sites each. They are down the hill, closer to the lake, and a longer drive through the rec area. We chose the Cottage area for its convenience and full hook-ups. It's been very quiet at night and our neighbors are considerate. We occasionally hear artillery fire and Blackhawk helicopters during the daytime but never at night. There are many acres of training ground between us and the main post. 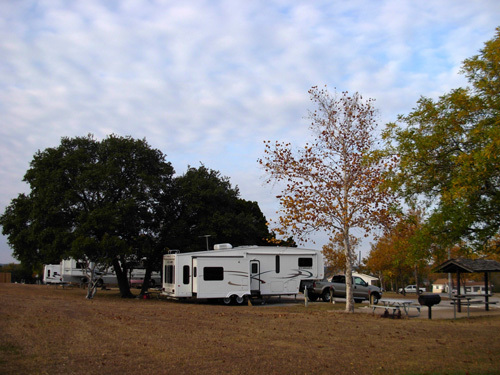 The sites at Cedar RV Park are the closest to the lake. The price for our large site with full hook-ups, three large trees, a charcoal grill, two picnic tables (one with a roof), a view of the lake, and easy access to the entrance is only $11.25/night with our senior discount (without the discount, the winter rate for full hookups is $15/day). That's hard to beat. Although there aren't any low weekly rates, campers can get great monthly and even yearly rates at BLORA. Jim and I have gone out every day to run, walk, and/or ride our mountain bike in the recreation area. 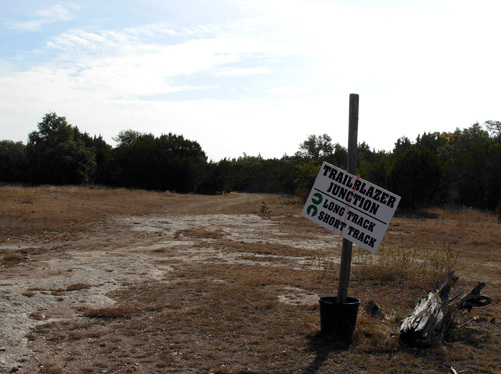 There are five or six miles of paved roads throughout BLORA and an unknown number of trails in the mountain bike park. According to the web site, there are several loops of varying difficulty ranging from four to fourteen miles. I haven't found a map of the bike trails on-line. 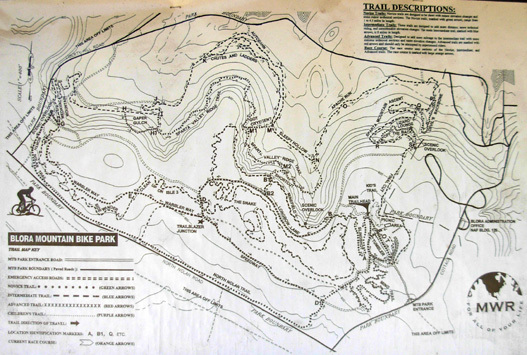 Our detailed paper map, like the one on the board (above) at the MTB parking area, shows lots of novice, intermediate, and advanced trails in a confusing maze that simply doesn't match some of the areas we explored. It's impossible for me to determine total distances accurately, but I'd guess there are 25-30 miles of dirt single track and double track trails out there. We weren't able to find all of them because of the complete lack of markings at many of the intersections, signs that are down and don't point the right way any more, and trails that dead-end. because of the wind. I set it up to take this picture and hope I got the arrows going the right direction! You'd have to be either nuts or under age 25 to have the bravado to ride some of the trails that go up and down the cliffs! They've got names like "Medivac Mountain," "Got Oxygen?" "Shortcut," "Minefield," "Devil's Backbone," "Lizard Lounge," and "Off the Back." (You can tell who they are trying to entice: risk-takers!) Jim and Cody "ran" one of those trails their first time out there. Jim hated it and almost didn't go back until I told him I found some smoother, flatter sections where we could train. 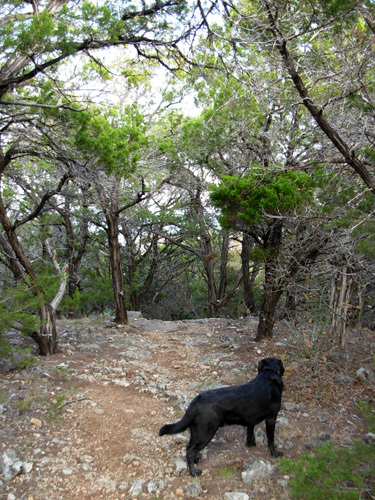 Cody hesitates near the edge of a cliff before the trail descends precipitiously. After that neither of us ran or rode on the very rocky, deep sandy, or steep sections but mostly kept to "novice" trails that more closely match the Sunmart course we'll be running next weekend. 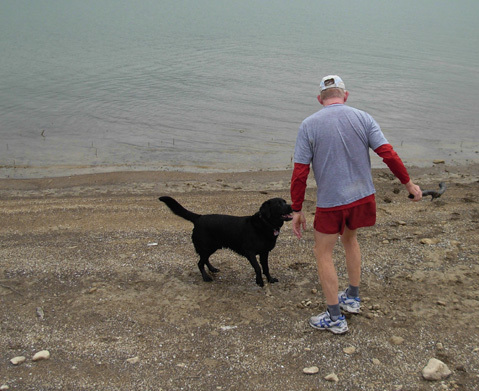 I tended to do longer loops and out-and-backs on the trails for one to three hours, while Jim did a few two- and three-hour sessions of 500-meter out-and-backs so he could practice his run-walk pattern and pace for ATY. We also did a 3-hour run on a 1K paved loop next to the lake that had 80 feet of elevation gain and 80 feet of loss per loop. Jim did 20 loops = 3,200 feet of gain and loss in 12.4 miles. I did 17 loops in the same time frame. 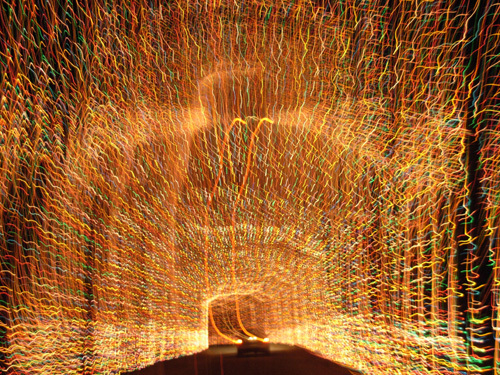 Lit up, it's an animated scene with elves and a choo-choo train carrying presents. Since we don't need near that much hill training, we did that workout only once. Our other runs were on the dirt bike trails. BTW, we saw only three cyclists on the bike course all the times we were out there running or riding. I'm a novice rider so I was limited to about five miles of easy trails. Others were just too rocky or too loose sand for my meager MTB skills. I did more road miles on the bike than trail miles. I know the trails at our next destination, Huntsville SP, are much better maintained and will be more fun to ride. Ditto for the regional parks around Phoenix. When Jim first contacted BLORA about camping here, the woman giving him information emphasized that if we arrived on or after November 21 we needed to be inside the gate by 5 PM "because of the lights." Jim mentioned it to me, but neither of us had a clue what she was talking about. Oh, boy. NOW we understand! 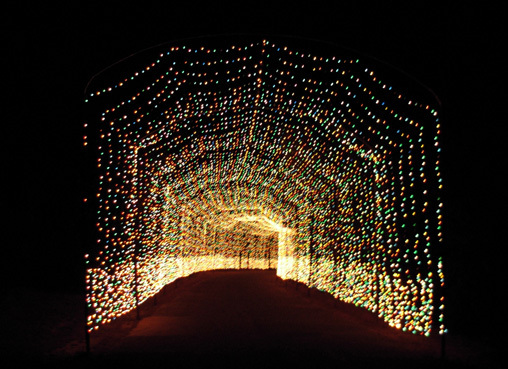 Once the "lights" came on the second night after we arrived, we made sure we were never outside the gate after sunset. After dark, the BLORA office is disguised as the North Pole. 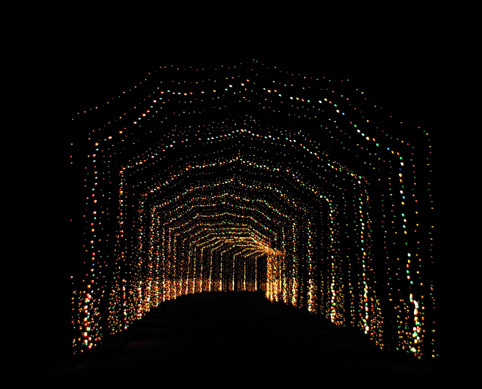 This is the twelfth year for BLORA's popular holiday light show. It lasts for six or seven weeks, until January 4. The rather deserted park during the winter day is transformed into a magical wonderland by night -- and becomes very crowded with cars lined up outside for miles before they can even get into the park. Some of our photos came out OK, many didn't. I kept saying I'd go back out and WALK parts of the "course;" I never did go back down the hill to the major displays near the lake because the traffic was so heavy from about 6 to 10 PM every night. Jim enjoyed the show once but I couldn't get him to go back out again. Now that we're ready to leave, I wish I'd driven the route another time or two. That gives us some incentive to return another year . . .
We can see some of the pretty lights from our camper. If we look hard we can also see the headlights of vehicles lined up at the gate to pay their $5 fee to enter (more for van-loads of people). It's pretty amazing to watch. Fortunately, none of that traffic goes through our campground loop and we can't hear it. Last night I talked with a couple of the security guards at the entrance. They just rolled their eyes when I asked how many people come through each year -- many thousands. Both indicated the fun really hasn't begun. On busy nights the cars are lined up, barely moving, for miles in either direction on Sparta/Nolan Road outside the park. They said people drive all the way from Houston, Dallas, and San Antonio for the spectacle. I'm impressed. 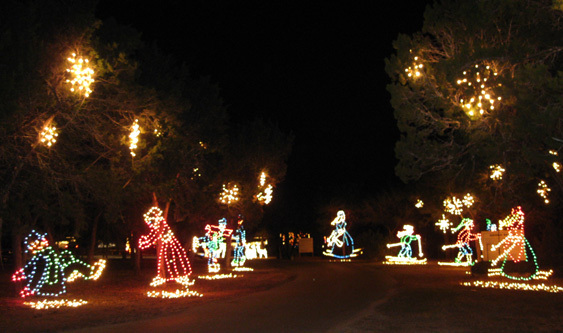 Halfway through the light tour visitors can stop at Santa's Village for food, drinks, seasonal crafts, and photos with Santa. The highlight of the light show comes at the very end (as do all grand finales! ), a point about four miles from our campsite and on a road that's closed during the day. 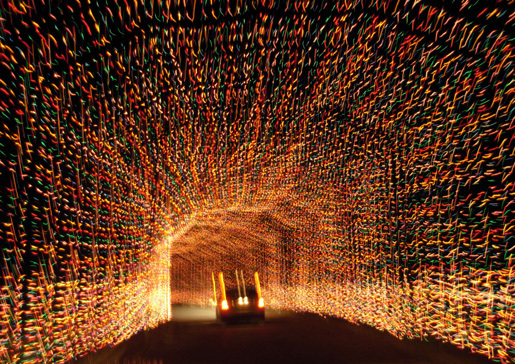 It's a 500-foot long tunnel of lights that pulses from just a skeleton of lights to the full Monty as you drive through. It's very cool. Vehicles exit BLORA on a different road than they enter. They're out of luck if they have to go back toward the entrance or into the park, with all the new folks lined up to do the tour. That's the main reason we haven't driven through a second time. It could take a long time to get back to our campsite. Guess I'm glad we're leaving tomorrow, since the guards say the crowds only get worse as Christmas gets closer. Yikes. How did the last eleven days at BLORA go so fast? For that matter, where did November go? ?